Capture your favorite music moment with our exclusive Black Notes & Clefs Picture Frame. 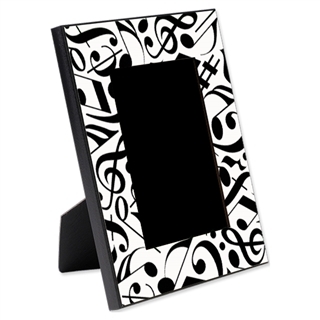 It's a must-have for displaying a picture of your favorite up-and-coming maestro and features a collection of black notes and clefs along the frame. You get a choice of either a 4" x 6" or a 5" x 7" photo opening and it's designed for tabletop display or hanging on a wall in either landscape or portrait orientation. Overall frame size is 8" x 10" x 5/8" and includes a back easel and protective glass plate. Made in the USA.